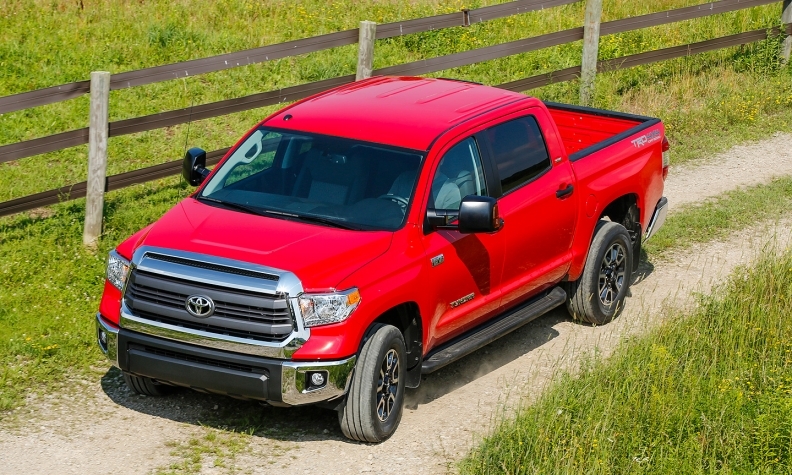 For 2014, the Tundra's equipment levels have been cranked up, adding more luxurious trim packages to boost transaction prices. While Toyota may be selling fewer units, it hopes to make a larger profit on each one. PITTSBURGH -- It is hard to blame Toyota for taking the conservative path with the re-engineered 2014 Tundra full-sized pickup. Toyota seems to have shifted from its goal of conquesting domestic truck owners. Instead, it now seems to be trying harder to retain Toyota loyalists. Notable features: Inside, the instrument panel design has separate binnacles for each gauge; now they are all under the same hooded display. Standard features include air conditioning, cruise control, power windows and mirrors, rear backup camera, 18-inch wheels, halogen headlights, front tow hooks, tire pressure monitor, trailer-sway control, variable windshield wipers with de-icers, dampened-release tailgate, front and rear mudguards, fold-up rear seats, two 12-volt auxiliary power outlets, six-inch touch-screen display and alarm system with engine immobilizer. Toyota now seems to be trying harder to retain brand loyalists than to conquest domestic truck owners. What Toyota says: "When we launched in 2007, we had the most advanced powertrain on market. Now [Detroit's engines] are just competitive," said Mike Sweers, Tundra chief engineer, at the press introduction here. "We updated the hardware and still have one of the most advanced powertrains on the market. In real-world testing, our 5.7 gets same fuel economy as their turbo-sixes, especially in a heavy-load towing situation." The market: The full-sized pickup market is recovering, but Toyota has conservative sales targets -- about 137,000 units in 2014, compared with its peak of nearly 200,000 units in 2007. With the Tundra and Tacoma built in San Antonio, Toyota can adjust production as needed, said Bill Fay, Toyota Division general manager. Fay said he sees "some upside" beyond the Tundra's volume target. The re-engineered full-sized pickup is available with three engines.